Artist Marcia Hafif was an extraordinary painter who devoted her six-decade career to experimenting with paint. Before creating one of her artworks, she would choose the brushes, type of paint and support she was going to use and only then would get to work on a new piece. 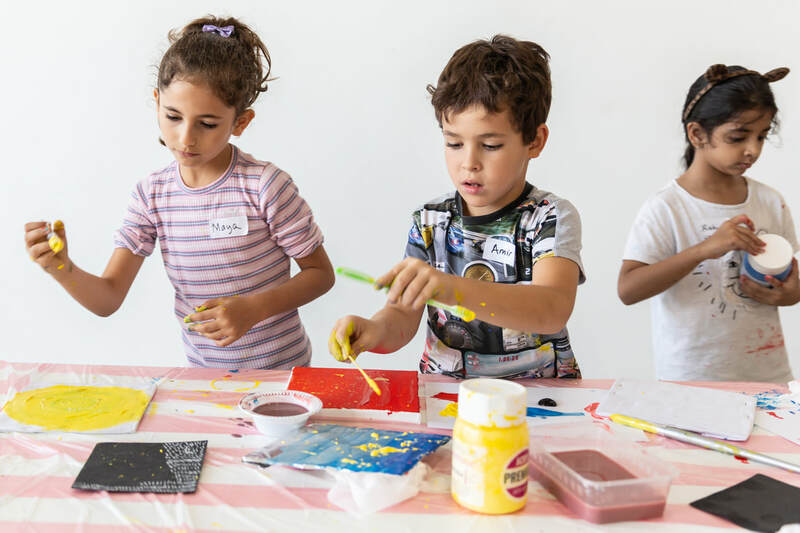 Following in Hafif's footsteps, children work with different colored pigments, mediums and formats to explore the meaning of painting. Expect fun and dress for mess. All our exhibitions feature extensive archival material that gives insight into the artist's creative and highlights important events in the artist's career. This often includes documentary photographs, projection, recordings, sketches, letters and text. ​Join JPNF for a unique workshop where children learn about process and experience building their own personal archive through collage. ​Jene Highstein produced many theater sets, often using abstract forms as part of his design. Join JPNF as we introduce children to Jene Highstein's work and the world of theater. Children will participate in designing a stage set, costumes and act out a scene. Workshop culminates with a performance for friends and family. This workshop reflects our commitment to education and combines the fun and excitement of working as a team with creativity, self-expression and critical thinking. Jene Highstein was a key figure of sculptural abstraction in the 1970s. He developed a sparse language using a range of media to create mounds, spheres and semi-ovoids that triggered associations with nature. Join JPNF for a hands-on adult workshop that delves into the artist's creative sculptural processes. Sculptor Jene Highstein used different materials like bronze, stone, steel and wood to form abstract objects inspired by the natural world. But drawing was also an important part of his practice. Join JPNF for a fun workshop that lets children get their hands dirty! Children learn different drawing techniques that help them to depict space, mass and weight on paper and then move on to clay, to create sculptures related to their drawings. Olivier Mosset was a member of the BMPT group. In 1967, BMPT organized ‘manifestations’ intended to encourage public participation. Working in groups, students write a manifesto responding to the theme, ‘Art is a Dream’. They will then choose two different art forms to express ideas within their manifesto: visual arts, music, theatre, and/or dance and present their work. Working together to build simple sculptures using geometric shapes, students engage in mathematical thinking and gain an understanding of the principles of geometry. They will propose a design and choose an appropriate material to construct their sculptural object. Olivier Mosset has dedicated himself to engaging with elementary geometric structures since the mid-1960s. he is best known for his early circle painting of 1966-74, which bear a black circle in the center of a white square canvas. ​Join JPNF for a painting workshop inspired by the iconic works of Swiss artist Olivier Mosset. Children choose simple geometric forms to learn about shape, line and color. They will also produce preparatory studies and write a short paragraph explaining theirs shapes of choice. ​What is the difference between a painting and a 'tableau'? ​Why is the 'tableau' so important to artist Pierre Dunoyer? In this two-part workshop, children explore abstraction through composition, color and form to produce works inspired by painter Pierre Dunoyer's work. They will then write a short artist statement describing what art means to them. Pierre Dunoyer spent 35 years advancing his notion of the 'tableau'. What is this an important concept for the artist? What is the philosophy behind his work? Join JPNF as we explore the abstract works of French artist Pierre Dunoyer through close-looking, lively discussion, drawing and other fun activities. ​Inspired by Alan Saret's delicate wire sculptures, children draw different objects and select their favorite to create a wire sculpture of their own. This workshop is done in collaboration with our wonderful friends at TASHKEEL. Our instructor for the morning is Tamsin Wildy, Tashkeel's, Studio Manager. Have you always wondered how to look at contemporary art? Join JPNF for our monthly session of Eyeballing when we explore contemporary art through close-looking, lively conversation, drawing and other fun activities. ​This month we explore the works of artist Lawrence Weiner. FAMILY PROGRAM: 1 -2- 3 ACTION! Inspired by Joan Jonas' iconic film Song Delay, 1973, participants work in groups to produce a short film and discover the importance of creativity, self- expression and teamwork. Children are encouraged to bring their video cameras, smartphones and other i-devices. ​This time we explore the abstract works of artist Richard Nonas. This is how Gordon Matta-Clark explores urban architecture. Using both photography and collage, participants experiment with different techniques that allow them to embrace an alternative aesthetic. ​Inspired by the poetic works of Richard Tuttle, children practice different watercolor techniques to understand composition, line and color. Join us as we explore seminal works in exhibition, Artist Run New York: the Seventies through close-looking, lively discussion, drawing and other fun activities. This workshop explores the important relationship between art and music. Moved by the collection of the JPNF vinyl collection, children express themselves through color. Join us for a fun family event as children discover the role creativity, friendship and teamwork play in the special relationship between patron and artist through fun activities like role play, writing and drawing. In this hands-on workshop, students share ideas and decide on a theme for their mural. They will learn about concept, composition and color. ​The workshop is lead by JPNF artist Judy Rifka and is held in conjunction with our exhibition, Judy Rifka: RETROactive.